Kim Seung-nam, chairman of PTPI Korea, says giving always leads to bigger gains. Whether it be love, people or business, Kim says one must refrain from seeking short-term gains and instead focus on the long term. Kim Seung-nam, CEO and chairman of Joeun System, is a firm believer in the power of giving. For the 67-year-old entrepreneur, giving has been one of the key elements that have pulled him out of crises and propelled his businesses to success. He says he has received more than he has given. While he was in his mid-50s, he established a company with only 10 million won ($8,500) and three workers. They set up in a small room given to Kim for free by one of his relatives. About fourteen years later, Joeun has grown into a top-tier security services company with more than 4,000 employees and annual sales of over 150 billion won. "I basically owe what I have achieved to hearty support from all the people around me," Kim said in an interview with The Korea Times. "I have tried to find out what I can do for the people I meet, and do it. Strangely, they have paid me back in a bigger way." Kim says he has built his life on passion and his "three mores" ― work more, study more and give more. 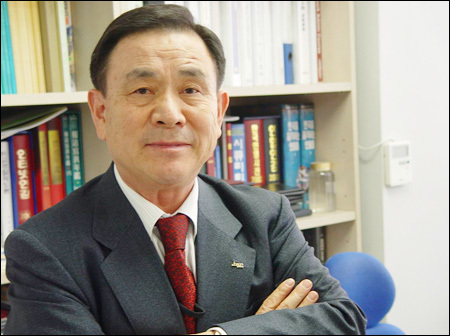 His philanthropic lifestyle eventually landed him the chairmanship at the Korea headquarters of People to People International (PTPI) last year. PTPI, a nonprofit voluntary organization founded in 1956 by U.S. President Dwight D. Eisenhower, seeks to enhance international understanding and friendship through educational, cultural and humanitarian activities involving the direct exchange of ideas and experiences among peoples of different countries and diverse cultures. The PTPI currently has 350 chapters in 48 member nations worldwide. As the leader of the Korea branch of the organization, Kim is capitalizing on the human network he has built throughout his life to expand nationwide chapters of the organization, another way of giving back to society. "Whenever I meet people and have the opportunity to give lectures, I try to encourage people to become PTPI members," Kim said. "A lot of people are joining our organization and they are engaged in various volunteering programs." The first Korean chapter was established in Chuncheon, Gangwon Province, in 1965 by then Gangwon Governor Park Kyung-won. In 1972, the PTPI Korea headquarters was officially inaugurated as a nonprofit incorporation certified by the government. In its early years, the organization has played a significant role in bridging the Korean community with American soldiers based here and boosting cultural and educational exchanges with international communities. It currently has 33 chapters across the nation and 27 university student chapters, with more than 3,000 members actively taking part in various volunteering programs. Kim aims to increase the number of chapters and members continuously in the future. This year alone, he is seeking to raise the number of chapters to over 40. "I plan to raise the number of chapters by 10 annually, with an aim to increase it to 100 by 2015," he said. "Our main mission is to develop and support programs for cultural and educational exchanges with foreign workers, multicultural families and American soldiers here." On top of attracting more college students and young people to its organization, Kim said he has put greater emphasis on encouraging business leaders, doctors, lawyers and other opinion leaders to join the group. "I'm forming a core advisory group comprised of dozens of opinion leaders as a way to make sort of a steering panel for our operations," Kim said. Kim said PTPI Korea will draw up and carry out measures to support multicultural families who are becoming critical members of Korean society. He said he has many opportunities to meet government officials who seek advice on policies. "Whenever I meet them, I talk them into allocating more funds for setting up centers to support multicultural families and their children," Kim said. "I firmly believe multicultural family members will become valuable assets going forward." He said they could become goodwill ambassadors linking Korea and their home countries. "I plan to expand programs to support these multicultural families using chapters across the nation," he said. "To do so, what's imperative is to root out prejudice against interracial families." Kim advised young people to take on challenges and look for jobs with long-term potential instead of pursuing short-term gains and higher salaries. He has experienced ups and downs throughout his life. Kim served in the army for 21 years before retiring as a lieutenant colonel. He worked for a provincial bank and an insurance firm before starting his own business. At one point, he saw most of his assets taken by a bank when guarantees he made for a colleague went sour. However, he refused to give in and managed to save 20 million won. Of that, he donated 10 million won to his church and started Joeun System with the rest. He is now the CEO of four companies. "I have enjoyed taking on challenges. If you challenge, it brings about changes. It's exciting to love the process of change," he said. Kim said young people seeking to land jobs should not be obsessed with salary. "They must show that they can have passion and the capability to work harder and better. Then they will get paid higher, naturally," he said. "I want to tell young people they should live a life of giving and volunteering." Kim has donated more than 2 billion won to schools and charity organizations. "I'm trying to be 'a man for others.' And I want young people to think hard about what they can do for others," he said. In 2007, he published an autobiographical book titled "Thank You," which showed his optimistic, thankful and passionate attitude toward life. Kim said he will donate all of his assets to his foundation for the good of public interests. He said he has already agreed to donate his body after death to a hospital for use by medical students. "My dream is to take on jobs that will help society and please God and go to heaven leaving no wealth behind," he said. Kim Seung-nam spent most of his youth serving the country as an army officer. He retired after 21 years of military service as a lieutenant colonel when he failed to get promoted several times. He worked for a provincial bank and an insurance firm before starting his own business. At one point, he watched as most of his assets confiscated by financial firms because loans tapped by his colleague and guaranteed by Kim went sour. On the verge of going bankrupt, Kim refused to give in and managed to save 20 million won. Of the money, he contributed half to his church and started Joeun System with the remaining 10 million won. Joeun has grown into a top security company and Kim now runs four firms. He started studying computers at the age of 46 and founded online employment information provider Job Korea. Kim is an active donor ― he has given more than 2 billion won to schools and charity organizations. In 2007, he published an autobiographical book, titled "Thank You," which showed his optimistic, thankful and passionate attitude toward life. In 2008, he took the chairman's post at the Korea National Headquarters of People to People International. He wants to increase the number of PTPI chapters across the nation by about 10 annually. He aims to raise it by 100 by 2015. He graduated from the economic department of Seongkyunkwan University. He has taken various courses at a number of graduate business schools. Kim said the driving force behind his success in business was the support from hundreds of people with whom he has maintained close relationships.